Daily Mirror - What was Daham doing in the UN? What was Daham doing in the UN? The Mahinda Rajapaksa regime was subject to serious allegations, while slashing attacks were levelled by the media, the politicians, and the civil society organizations against the rule by a single family. It was gathering momentum as the Presidential Election came round. However, the Presidential Election on January 8 brought the Rajapaksa rule to an end. The people were longing to see the dawn of a new era. President Maithripala Sirisena said that his victory was the result of a silent revolution of the people. He made several vital decisions after swearing in at a simple ceremony and earned popularity before long. Sri Lankan social organizations highly appreciated his policies and he outwitted his predecessor in the Facebook comments. However, the steps taken by him to increase Cabinet portfolios, appointing defeated candidates to Parliament on the National List and offering them Ministerial portfolios have been subject to severe criticism. It was in such an atmosphere that the President left for the United States of America to attend the 70th UN General Assembly sessions. He was flown by an ordinary flight. Presidential Secretariat that gave publicity to the President’s official visit to the US, however failed to explain the circumstances that led to his son, Daham Sirisena’s participation on the delegation. It is also in question why Daham Sirisena was not in any of the photos released to the media. 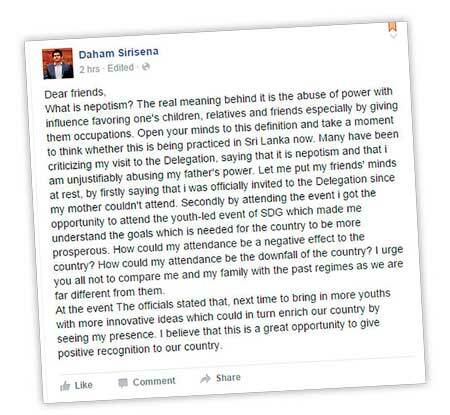 However, Daham Sirisena had published in his Facebook account the photos of his participation. However, the Presidential Secretariat had not made a clarification on what basis had Daham Sirisena joined the delegation. The unofficial sources of the government earlier said that the President’s tour in America would be entirely different from former President Mahinda Rajapaksa’s visits to the US to attend the UN General Assembly and justifying it fewer delegates joined the tour. It is also reported that they did not use luxury hotel facilities during the tour. However, we still maintain our view that former President Mahinda Rajapaksa’s son Namal Rajapaksa’s participation in a previous UN General Assembly was not justifiable. True enough, that President Maithripala Sirisena’s New York tour was not pompous, but anyone in the country would not appreciate his son’s participation in the UN Assembly. Meanwhile, the rival parties that are up in arms against the President would use Daham as the sheet anchor of their campaign and it was clearly indicated by the comments that appeared in the social websites between September 25 and 27. About 90 percent of the comments were critical. Everyone in the country including President Maithripala Sirisena knows pretty well that Facebook comments played a major role in building public opinion during the last Presidential Election. Daham Sirisena’s participation at the UN Assembly will personally benefit him, but the people would not appreciate it in any manner. Daham had this opportunity as his mother did not join the tour. However, the delay in making an explanation in this regard resulted in severe criticism. The failure to give an acceptable explanation regarding Daham’s joining the tour even tarnished the image of the President. He was not subject to such allegations in the case of his previous visits to India, the United Kingdom and China, and he was lauded for his actions. The mistake should be corrected, but without worsening the situation. Daham accompanied the President to UK and China as well. Its a reasonable, inevitable, essential criticism! He as son can join Mythri as his father in the place of his mother. But its not acceptable to sit near his father like a delegate in the UN Assembly UN Assembly is not a place of wedding house or a place of Social ceremony to participate as guests. In my opinion....In the strictest sense of policy, this is not acceptable However, all over the world, a family member accompanying - is very common.Let us not forget that Prez put the life of his family at stake to save our Nation; not to forget his own!I hope - through this exposure, Daham, can grow up to be a more responsible person.Still Prez should provide an explanation.I think - it wold have been more palatable, if he had paid at least for his ticket. This article meant to defuse adverse criticism yet another Sirisena YAHAPALANA ACT Day by day Sirisena doing intended job with out any shame.